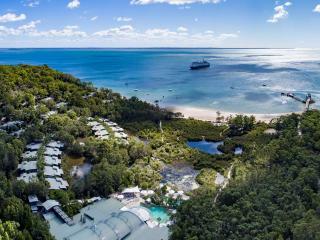 Located at the halfway point between 75 Mile Beach and Happy Valley, Sailfish on Fraser offers self-contained apartment accommodation in a stunning location. Close to Cathedral and Eurong Beach, the resort enjoys the charming atmosphere of a small village complete with convenience store, café, restaurant and fuel station. Accommodation at Sailfish on Fraser offers a number of 2 Bedroom Apartments complete with self-catering full kitchen and laundry facilities, a TV, video and CD player and private balcony with beautiful resort, garden or beach views. Sailfish on Fraser also enjoys a great range of onsite facilities including a swimming pool complete with jet spa, undercover parking and car wash facilities, a large terrace complete with BBQ facilities, fishing tackle and car hire as well as child friendly facilities. The resort is also close to a range of Frasers most spectacular attractions including the Champagne Pools, Maheno Shipwreck, Eli Creek and more. Accommodation at Sailfish on Fraser offers fully self-contained 2 Bedroom Apartments with balconies. 2 Bedroom Apartment: Bedding is 1 Queen Bed + 2 Single Beds. Maximum room capacity is 6 Adults & Children. For those you really want to relax and stay out of the kitchen, you can take advantage of the nearby bar, bistro and shopping facilities, just a short stroll from your apartment. We spent 2 nights at Sailfish and will definitely book here again. The rooms were clean and spacious with big patio's. The managers were very friendly and helpful. Undercover parking was a treat, even for our 4wd needing 2.2m clearance. Location, 1/2 way up the Islands East coast, was ideal for us. The locals told us the best fishing was in that part of the island anyway. We didn't use the fully kitted kitchen and ate at the pub 100m up the road. Meals there were standard pub fare which was fine. Big thumbs up from us!